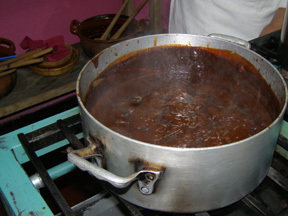 Mole Poblano, a rich and spicy sauce that is made with chocolate, chile peppers, tomatoes, onions, garlic and plantains, is one of the most famous recipes of Cocina Poblana (Pueblan Cuisine), and Chef Alonso Hernández of the restaurant Sacristia de la Compañía at the Mesón Sacristía de la Compañía in Puebla, Mexico graciously shares his delicious recipe that is sure to make you want to book a trip to Puebla immediately to taste the other famous dishes of the region. I met the highly acclaimed and widely celebrated Chef Alonso Hernández while I was taking a 1-day cooking class with him in late October 2009 at the restaurant, Sacristia de la Compañía, located in the antiques filled luxury boutique hotel, Mesón Sacristía de la Compañía, that is also an antiques gallery. 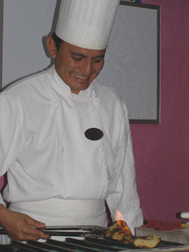 Chef Alonso Hernández honed his culinary skills after graduating from a Mexican Culinary School, by training in Europe in Belgium and Spain, as well as in Mexico in Cancun and Mexico City, before coming to Puebla and teaching cooking classes for the last 6 years. 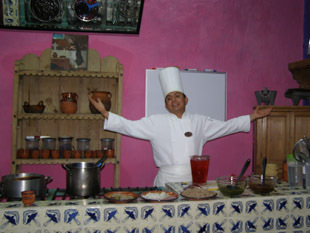 In his free time, he has also contributed to a cookbook featuring the top chefs of Mexico. He graciously shares his recipe for Mole Poblano, from the cooking class, which is traditionally served over chicken or turkey, however it is also delicious over enchiladas or served with seafood. Buen Provecho! Method: Remove the stem and seeds from the chiles. Heat vegetable oil in a frying pan over high heat and quickly fry the chiles one at a time, for a few seconds until the chile is golden inside and crispy. Do not overcook. Remove and set aside on a plate. 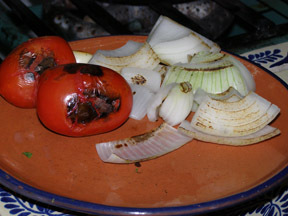 Place the tomatoes on a hot comal (a griddle or grill used in Mexican cooking) or in a hot frying pan over high heat, do not add oil, and turn them throughout the cooking process until black spots appear on the tomatoes and they are beginning to soften. Remove the tomatoes from the pan and set aside on a plate where their internal temperature will continue the cooking process. Next roast the onions and garlic until they are golden. Boil the chiles, tomatoes, onions, and garlic until the chiles become soft to make a sauce. In small batches, add the mixture to a blender, cover and remove the center cap to allow the steam to escape, cover the small hole with a heavy kitchen towel, hold in place with your hand, and process until smooth. Strain the mixture into a large bowl. Repeat with the rest of the boiled mixture. Remove the skin from the plantain and cut in half widthwise, and then cut in half again. Add a small amount of vegetable oil to the comal or frying pan and fry the plantain until golden brown. Roast the tortilla directly over the flame until completely black, which will give the mole its nice smoky flavor. (This may also be done on an outside grill.) Place the plantain and the blackened tortilla, and 1-cup of water in the blender and process until smooth. Strain into a bowl and set aside. The sauce will thicken as it sits. In a large, deep pan, add vegetable oil to lightly cover the bottom of the pan, heat, and then slowly add the red sauce (from the chile and tomatoes) taking care to slowly pour the sauce over a spoon into the oil so that it does not splatter. Bring to a boil and cook for a few minutes. Next, add the plantain and tortilla sauce to the mixture, and bring to a boil. Add the finely chopped chocolate, season to taste with salt and sugar, and simmer for 45 minutes. Serve over chicken or turkey. 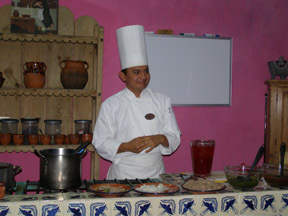 Sacristía de la Compañía offers 1, 3, and 5-day cooking classes that are offered with or without accommodations at the hotel, Mesón Sacristía de la Compañía. Call or email the restaurant in advance to reserve a place in the cooking classes. 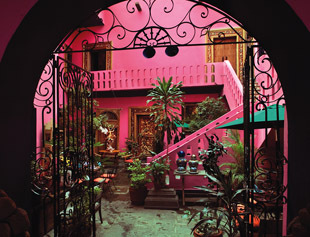 Read about Sacristía de la Compañía in the Restaurants section and about the cooking class in the Gastronomy section. 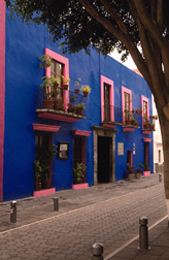 Please read other articles on Puebla, Mexico in the Destinations, Hotels and Resorts, Restaurants, Gastronomy, Chefs' Recipes, and Arts sections.